Historic Mack Truck Boxcab Locomotives numbers 3 and 4 that were both scheduled to be scrapped by a fledging tourist rail line has one of the locomotives saved and restored by McHugh Locomotive & Equipment. 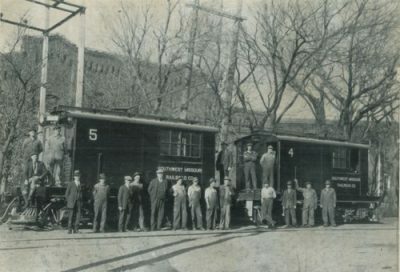 The Southwest Missouri Railroad Company in February 1924 ordered a mated pair of electric interurban type boxcab’s from GE for the amount of $30,900.00 with a completion date of 01 March 1924 at Erie PA. The boxcab’s arrived on the property as SMRC numbers 4 and 5, with a drawbar connecting the pair and a coupler at each end. 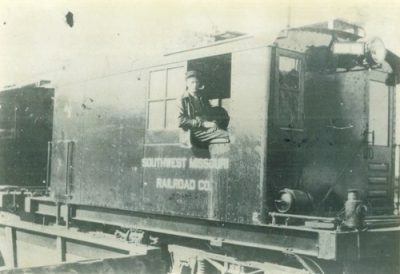 The SMRC during 1927 built two identical boxcab’s at their own shop located in Joplin, MO. The original 1924 GE built 4 was connected by a drawbar to one of the new 1927 built SMRC units and numbered 3. The original GE 1924 built 5 was connected to the other new 1927 built SMRC unit and numbered 6. Then in 1929 the SMRC built two more identical boxcab’s that were connected by a drawbar and numbered 7 and 8. When the SMRC ceased operation sometime around 1939 the original 1924 GE built number 5 and SMRC 1927 built number 6, along with the 7 and 8, were scrapped. The original 1924 GE built number 4 and 1927 SMRC built 3, were sold to Mack Truck Inc and shipped to Allentown PA. This information was documented by a former SMRC employee that worked for the company until the SMRC ceased operation. The documented information in 1967 was forwarded to Dave Biles an employee at Mack Truck, and also a volunteer at the trolley museum that acquired one of the boxcab’s. Mr. Biles over the years complied an extensive amount of documentation and photographs regarding the two former remaining SMRC boxcab locomotives that we have retained in our records. All of this material indicates that both boxcab’s retained their respective numbers 3 and 4. The NRHS Lehigh Valley chapter in 1959 published a book that covered all of the locomotives and railcars that were manufactured by Mack Truck, and it also identifies the two boxcab’s at the Allentown PA plant as number 3 and 4. Mack Truck Inc. between 1905 and 1939 built a total of 21 locomotives and sold 19 of them, except for the number 3 and 4. The boxcab’s were rebuilt as gas electrics and were the only 4 axle units produced by Mack Truck. Some of the former Mack Truck employees that worked at the company during the early 1950’s to the 1980’s, have stated that the 1924 built GE number 4 was repainted and had a Mack logo applied for its entire stay at the Allentown PA plant. These folks have also stated that the SMRC 1927 built boxcab 3 retained that identification number and it was painted Mack green, but never had a Mack logo or number applied while at the Allentown PA plant. There has been some confusion in the railfan community that boxcab 3 was renumbered 5 while it was at Mack Truck. However, that can not be documented as fact. During 1939 the boxcab’s 3 & 4 were retrofitted at the Mack Truck factory with two six cylinder EP Mack gasoline in-line 6 cylinder engines. The engines were connected to a 1503 General Electric 300 volt generator that where wired in series to provide DC electric to power the 600 volt traction motors for travel. The two units were offered for sale as a new product of Mack Truck but were never sold do to issues with the electrical system. The 3 and 4 were then operated as plant switchers at the Allentown PA 5A and 5C plants to about 1959. After that time the two boxcab’s were occasionally operated to spot a random railcar and basically were parked on a siding. 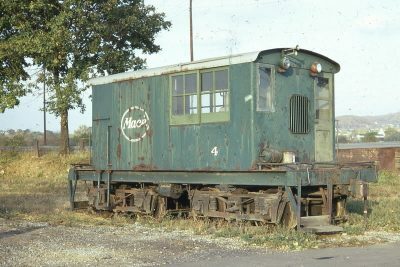 Mack 4 in 1967 was acquired by Railways to Yesterday a trolley museum located in Rockhill Furnace PA. 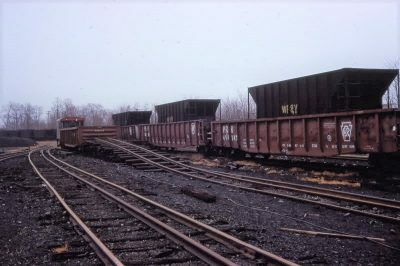 The boxcab in November and December 1969 preformed the last switching duties at the historic dual 3 foot narrow and standard gauge rail yards in Mount Union PA at the East Broad Top Railroad & Coal Co. Mack 4 during March of 1970 was moved to an eastern PA short line the NH&I where it was briefly used until its departure in January 1971. Mack 4 was then stored in Penndel PA from 1971 until 1986, when the boxcab was transported by truck to Kempton PA where it rested on the ground for 22 years. Mack 3 around 1978 was acquired by a fledging tourist line located in Kempton PA. 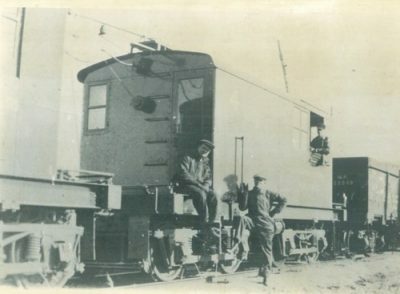 The boxcab was renumbered as 35, because the new owners thought the weight of the locomotive was 35 ton. This boxcab was briefly operated here for a few years until one of the engines blew up due to low oil level. The boxcab was operated on occasion with only one engine until an electrical fire occurred. The group then attempted to make repairs to the boxcab, but aborted the project. 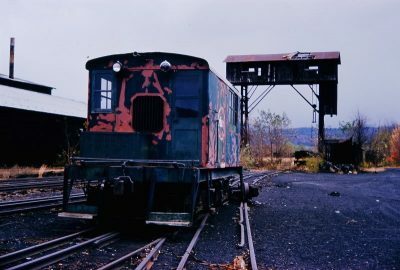 Unfortunately, the Kempton PA tourist rail line stripped both of the two rare boxcab’s of many valuable components and parts, that were required to be keep the in locomotives in operation. During early 2008 when scrap reached an extremely high price, the Kempton PA tourist line considered to have both rare boxcab’s see the flames of the scrapers torch to generate necessary revenue that it required. However, during March of 2008, JC McHugh purchased both boxcab’s to ensure that at least one of the rare Mack boxcab’s was saved from this fate. 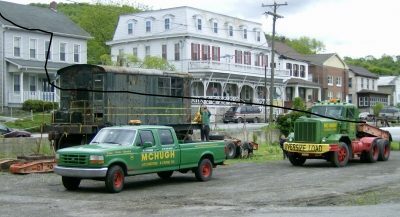 During late May of 2008, both boxcab’s were removed from Kempton PA by tractor trailer and transported to the McHugh Company so they could be salvaged to make one Mack locomotive. 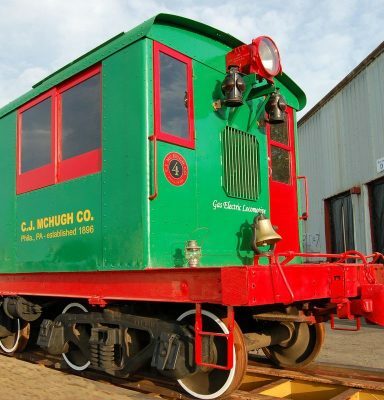 The McHugh Company, quickly restored one of the rare boxcab’s and painted it in a McHugh green and red paint scheme. The boxcab was lettered under the cab windows C. J. MC HUGH CO. / Phila. PA / Established 1896, and on the front locomotive cab a builders plate included the number 4. On the side of the locomotive it was lettered MACK TRUCKS, INC railcar division / gas electric locomotive. Both of the boxcab’s were also missing truck assemblies, so the saved Mack locomotive was placed onto a set of powered locomotive crane truck assemblies. The restored McHugh 4 boxcab Mack locomotive was transported to a historic equipment / antique truck show at Brownsville PA ( south of Pittsburgh PA ) for a August 7, 8, 9, 2008 event. 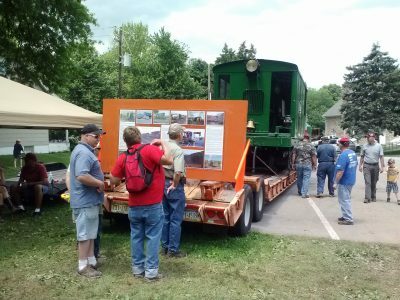 The enthusiast and general public that attended the show enjoyed seeing the McHugh 4 boxcab Mack locomotive displayed at the event. However a few railfan’s complained that the locomotive was not painted into a Mack Truck heritage color scheme. It was more important to JC McHugh that one of the rare Mack Truck boxcab’s was saved and he was not concerned that some railfan’s may not like the color scheme applied to his locomotive. The McHugh 4 boxcab retained the McHugh color scheme and it was displayed at the 2009 and 2014 historic equipment and antique truck show held at Macungie PA. In April 2015, a few friends and some retired employees of the Mack Truck company, inquired if we would consider repainting the locomotive into a Mack Truck inspired color scheme and display it at the National Historic Equipment and Antique Truck Show to be held at York PA in May 2015. The McHugh Company fulfilled the request of those who wished to see the saved boxcab locomotive painted back into a Mack Truck Inc livery. We painted the locomotive in a dark green Mack color with a Mack Truck logo applied to the side of the unit with a very small 4 under the window to represent the two boxcab’s service at the Mack plants. While displaying Mack locomotive with our 1929 Ford AA stake truck at the York PA 2015 event, we met Dave Shirey and he express an interest to have the boxcab at the GCRM. 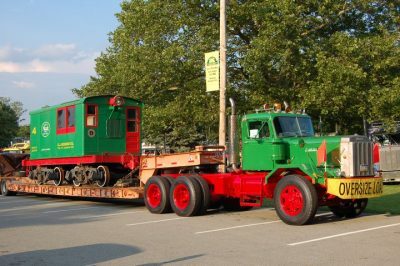 The McHugh 4 boxcab locomotive was displayed again in the same Mack Truck livery at the Historic Equipment and Antique Truck Show held in June 2016 at Macungie PA. Since late July of 2008, the boxcab Mack 4 locomotive has been proudly on display at the entrance of the McHugh Company, except for the times that it has been at show events. After the restoration of the Mack truck locomotive in 2008, JC McHugh has been approached on several occasions to sell or donate the rare boxcab to various railroad museum groups or private parties. Geigertown Central Railroad & Museum, will become the new caretakers for the Mack 4 locomotive. During late 2018 an offer made by Dave & Paul Shirey to purchase the McHugh 4 boxcab Mack locomotive for the amount of one dollar with specific terms and condition of sale that were acceptable to both the McHugh’s and Shirey’s. The terms of the sale pertaining to the Mack 4 stipulates that the locomotive can not be: sold, leased, traded, or loaned to any: corporation, non-profit organization, or private party, nor can it be scrapped. This agreement also includes that if the GCRM or Shirey’s no longer desire Mack 4, that the locomotive will be sold back to the McHugh family for the amount of one dollar. 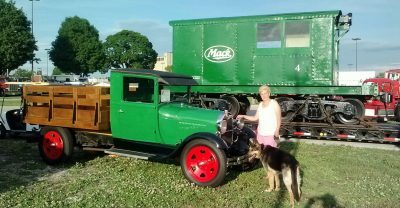 The McHugh family plans to display Mack 4 one final time at the Antique Truck & Historical Equipment show located in Macungie PA on the 14th & 15th of June 2019. 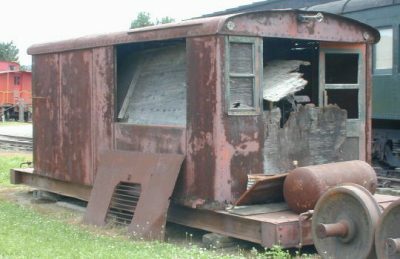 The old boxcab locomotive will then be transported by the McHugh Company to the Geigertown Central Railroad & Museum and the Shirey family will become the new caretakers of Mack 4.